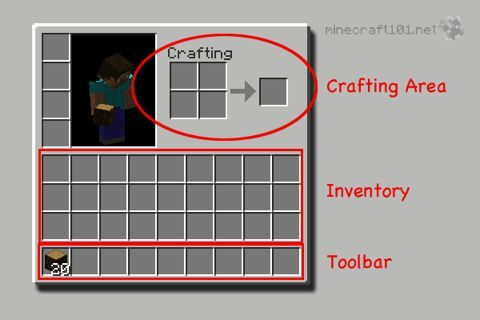 Crafting is one of the most important parts of the game in Minecraft; you won't get far without it! Related arts that you won't need until later in the game are potion brewing and enchanting. Crafting is a simple matter of arranging components in the right pattern so that they make a product. 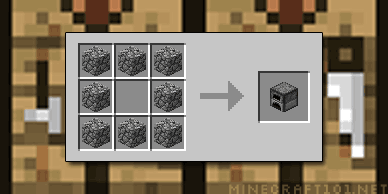 One of the first things you'll want to do is create a crafting table, that provides a 3x3 crafting area. First, collect some wood by punching a tree. 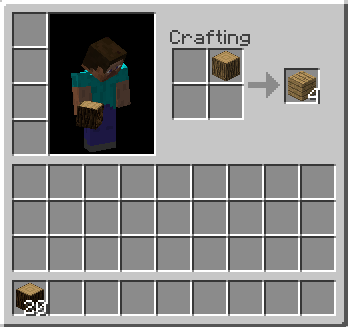 Then open your inventory screen and place one piece of wood in the crafting area. You will see that you can turn it into 3 planks. 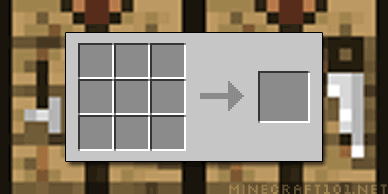 The 3x3 crafting area at the top is sufficient for any recipe in Minecraft. 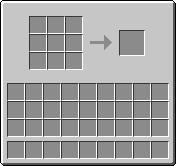 Any recipe that will fit in a 2x2 area can be made on either a Crafting Table or in the normal Inventory screen, it doesn't matter. Some foods are crafted, some are cooked in a furnace. Read all about it here. A furnace is used to smelt ore into metal, turn glass into sand, bake clay into bricks etc. More on furnaces here. Enchanting turns your crafted items into something even better! When you're ready, read about it here. Not booze &emdash; magic potions!